I'm so amped for Emily and Joan! What a fun endeavor! I know they will be taking nurseries by storm and it ALMOST makes me want to have a baby. But alas, Jeff has reminded me that decorating is in fact not a good reason to have a child. Sigh. I did something last night that is super unusual for me. I bought a rug. Like, a big one. I haven't been opening any of the enticing sale emails that have been inundating my inbox. #1 I'm not buying from big box stores right now and #2 I'm not spending money on 'me' right now...tis the season! BUT THEN... I noticed that West Elm was having a one-day 30% off on all rugs sale. 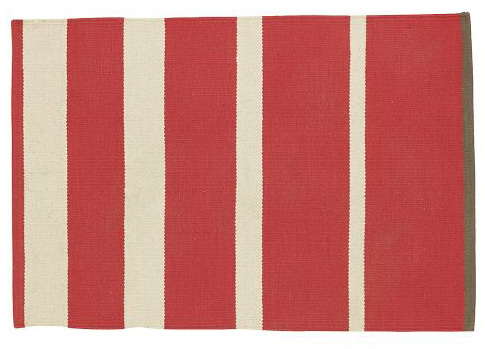 And I remembered this awesome pink, striped rug I had seen in the catalog. And this rug, in pink 9' x 12' (HUGE) was only $168.00. WHAT! And now she's alllll mine (and Jeff's). I'm definitely not 100% convinced that this will work. We bought it for the living room because our current (and beautiful) antique rug is falling apart and I want to get it rolled up so we don't do any more damage. We did not buy this new rug thinking it would be our forever rug. It's cotton, and white and $168, but I think it could carry us over for a bit and more importantly I think the coral color will look killer with our coral kitchen and charcoal living room. PS: I'm so exited for your upcoming trip, and also SO excited that Lil' Miss is coming to DC for the first time EVER this weekend! PPS: I HATE cleaning. It can be so rewarding, but also in our ancient apartment, I can end up feeling like it will never be truly clean. I cleaned yesterday and I know you're cleaning tonight... check out this list from AT. I think I'm gonna try it because it seems so do-able and less overwhelming than the once a month "OMG this apartment is a freakin' mess!" I'll keep you posted. PPPS: (This is it I swear). Did you see this beautiful video about NYC? 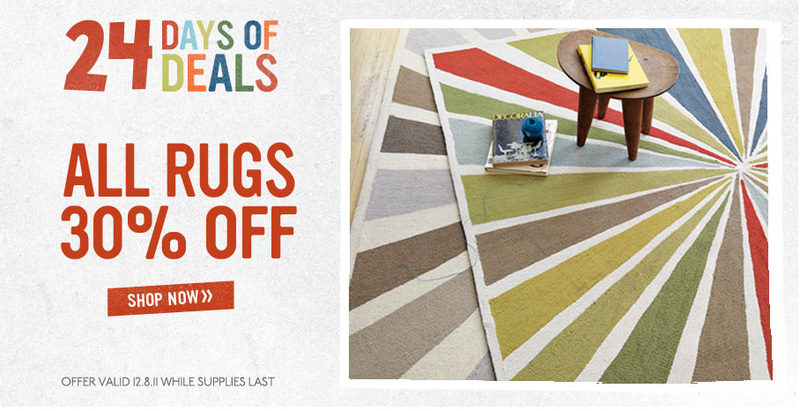 I was literally on the West Elm site three times yesterday looking for a rug and somehow didn't notice the sale! Ugh. Painful. But love your new pink one! WHAT a DEAL!!!! Not to mention, I love it. I think it will give your room a new modern feel and will look awesome with the couches. Congrats, D!